A woman has given birth to six babies at the Royal Jubilee Maternity Hospital in Belfast. They are four girls and two boys, weighing between 1lb 7oz and 2lb 2oz. The mother conceived the babies naturally, without the aid of IVF. The babies were delivered by caesarian section and were 14 weeks premature. The babies' parents have requested that the family's privacy is respected and they will not be available for photographs. Thirty medical staff were involved in the deliveries which took place between 1119 and 1124 BST on Friday. The team was led by neonatal consultant Clifford Mayes. Mr Mayes said the six babies were in intensive care and doing as well as could be expected after being born 14 weeks early. "This is both a happy time and a potentially difficult time," he said. "It is an extraordinary thing to have witnessed but you are also struck by the fact that there are little babies in intensive care." 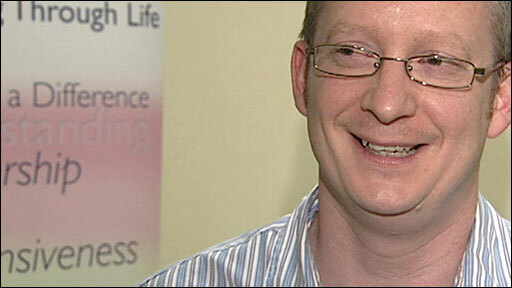 He added that there had been weeks of preparation including technical experts from across Northern Ireland. "We have planned very carefully for today and it went as well as we had hoped it would." Midwifery sister Patricia Denvir said the birth had gone "very well". "The mother was very composed - under a very stressful situation, both parents were very composed and they dealt with it very well," she said. "It is a very emotional time but it's also very stressful for all concerned." 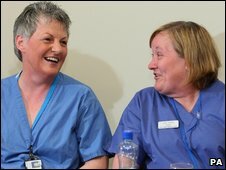 A hospital spokesperson said they had contingency plans in place for such a rare event, and were working with colleagues across Northern Ireland to ensure they could cope with the extra demand placed on resources. 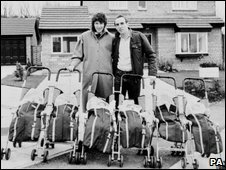 Previously the largest multiple birth in Northern Ireland was quintuplets born in 2002. The birth of sextuplets is rare across the world, occurring in about one out of 4.5 million pregnancies. It was the first recorded birth of sextuplets on the island of Ireland, and the first in the UK since 1993. The best known in the UK are the Waltons, born in Liverpool in 1983. Now aged 25, four of them are still living with their parents in Wallasey, Merseyside. Their father, Graham, 58, advised the parents in Belfast to "enjoy every minute". "I would never offer anyone advice on how to raise their children, but as a father of sextuplets, I can say a sense of humour is vital," he said. "All I can say to them is that there will be lots of tears, as with any family, but there will also be lots of fun and special times ahead."